Okay, so… I’ll be really honest here, I was about to drop Boruto Naruto Next Generations. The last four or so episodes have been abysmally poor, and with some big changes in my personal life happening, I was thinking it was about time to let this series go, as far as blogging goes. 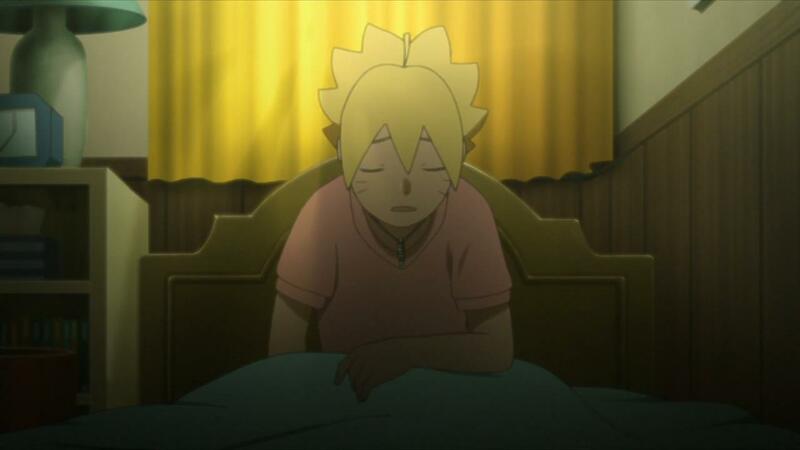 Boruto NNG isn’t a terrible show, but in the last few weeks, I haven’t had much good to say about it, and that honestly breaks my heart. 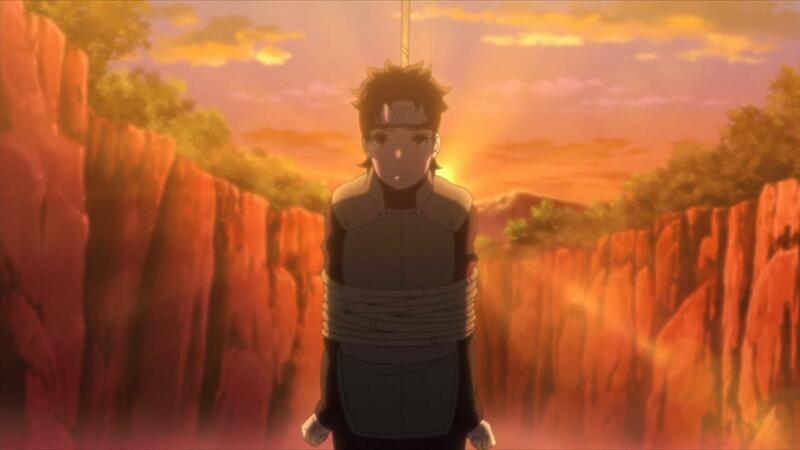 It breaks my heart, because the Naruto franchise is a franchise that I’m a huge fan of. 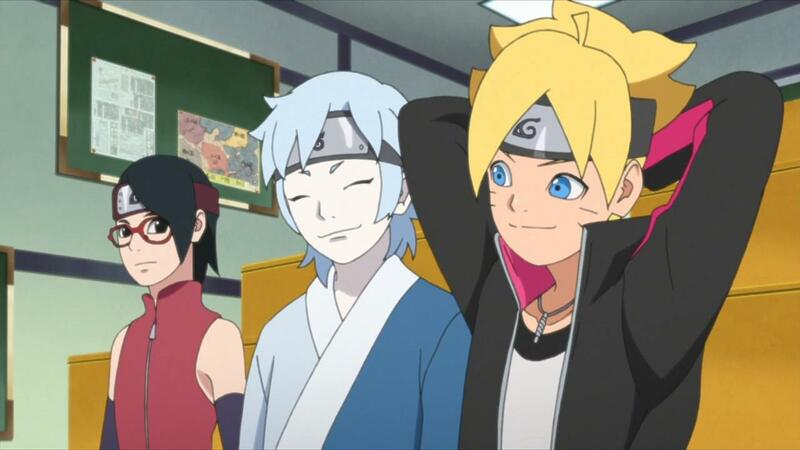 I like Boruto as a character and protagonist as well, and I think there’s a huge amount of untapped potential in this future generation story angle that the franchise is using. Having said that, the anime has, with the exception of one arc, mostly been filler. Not only that, the stories we’ve been seeing having been really childish in terms of tone, and have asked for waay too much suspension of disbelief. So with that said, why am I still here, talking about this series? Well, to be honest, because this was an episode that was good enough. It convinced me off the edge, and gave me some of what I had been wanting from this franchise. It gives me hope that, in the end, once we get off this filler nonsense, the show will actually pick up and tell an interesting story. Simply put. the writing staff in charge of Boruto NNG isn’t all that great, but I guess every now and then they can throw in episodes like the one this week, that give me a reason to continue on. Boruto NNG – A “Got Milk?” Ad…? I was always going to watch Boruto NNG, but talking about it week for week was getting difficult. Mostly because the writing was so terribly bad, that it hurt, and all I got out of this show was a “this is mediocre”. I will say that we still haven’t reached the levels of bad that the original Naruto series had when it went on fillers for two years, but last week definitely had us pretty darn close. So what changed this week? Well simply put, we got the answer to a question I’ve always had; How did Boruto and Sarada end up working together and being friends? Its a story that I thought the series wanted to desperately tell, given that it decided to start before the Boruto Movie, timeline wise. And in the end, the answer we got this week wasn’t amazing, but it made sense. 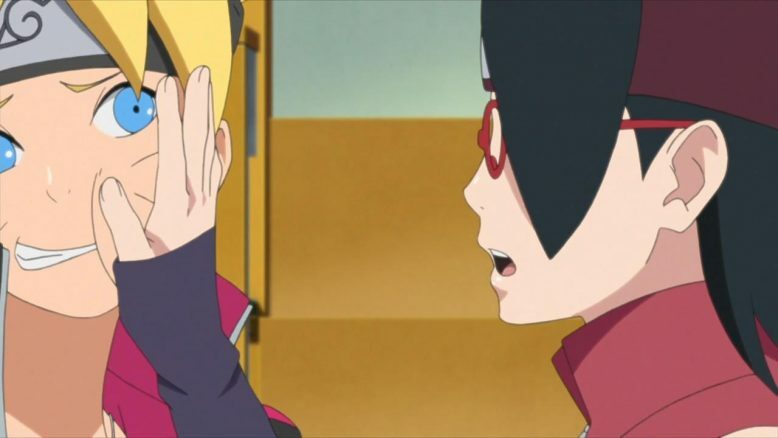 Boruto and Sarada have a very complicated relationship…. It was just good enough. 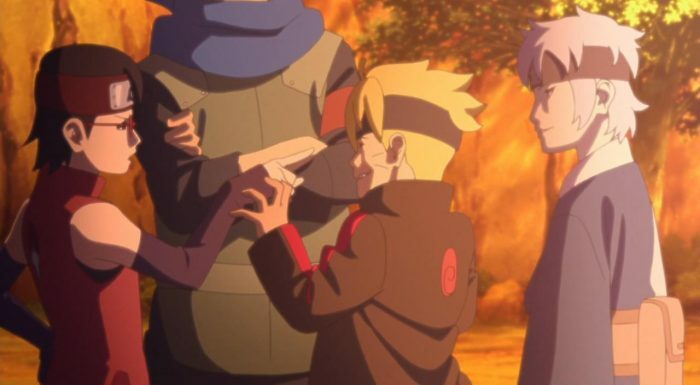 I will say that the Boruto and Sarada in Boruto NNG are a bit different from the characters we see in the movie. Given that we’re getting close to it, I’m kind of surprised at how at odds Boruto and Sarada are. Yes, by the end of the episode, the two come together and are able to form a team, but we’re still far from the dynamic where Sarada wanted to be the next Hokage, and Boruto wanted to support her. But I suppose, in the context of the series, what we got this week made sense. Sarada and Boruto have been at odds since the start of the series, so the fact that the two recoiled against the idea when they were put on a team, makes a lot of sense. I say that, but it was more Sarada than Boruto, in this particular case. She clearly doesn’t like Boruto, or can’t seem to stand him, and there’s this real “opposites who can’t stand each other” dynamic that’s present here. The fact that we get an accidental kiss joke in the show, makes me think that there’s a shipping angle being played here. I used to think, in this very series, that that would be cool. But as of now, I don’t think there’s much chemistry here. 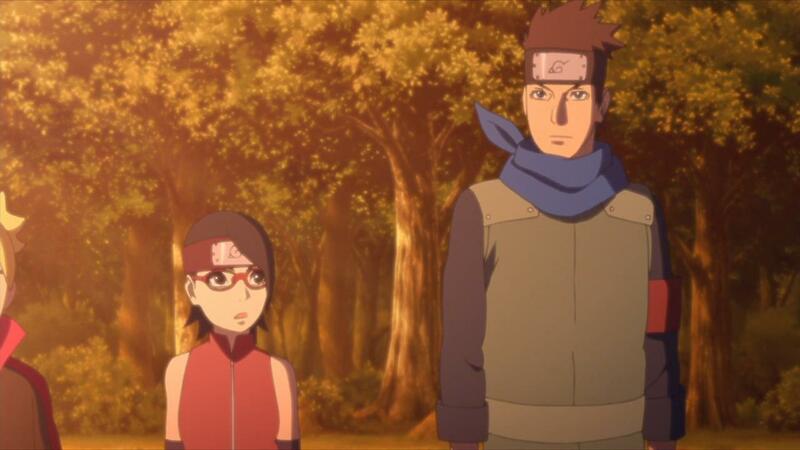 In fact, while I applaud Boruto and Sarada for coming together as they do, I’m not sold on the two of them as a team, let alone a couple at some future point in the story. 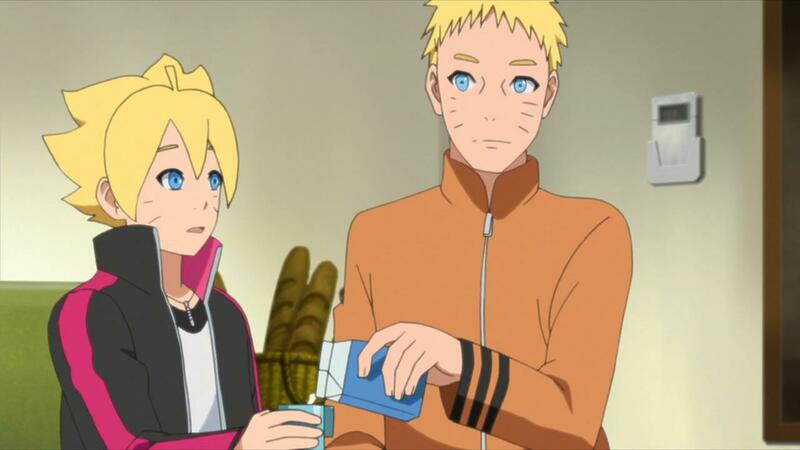 I would say the series has a big task on its hands to develop these two into a likable pair, but this is Boruto NNG we’re talking about. The show isn’t even going to bother actually developing this relationship. So this episode, which was decently done, with the two of them being herded into working together, is probably the best we’re going to get. Sarada, apologizing to Konohamaru in advance for how little he’s actually going to benefit from this new captain position in the story. Which I suppose, I’m okay with. I mean, the story itself, while pretty generic, worked. The execution was decent too, and the fact that I didn’t groan in annoyance at anything this week, is a big improvement. Plus I liked the little addition of the trio requesting Team 7 as a name. I always wondered how Boruto ended up getting the same team number as his dad, but Sarada actually requesting it makes a lot of sense. I wish we had more moments like this, where the series would provide context and elaborate on small details like this, rather than just annoy. The other thing that I quite enjoyed, was the fact that Konohamaru ended up being the captain for Team 7. I personally love the idea of Konohamaru playing off Boruto, Sarada and Mitsuki. If this were a really good series, I’d be speculating on how this new dynamic was going to work in the coming stories but… I’ll be honest, I’m still pretty sore from the last few weeks. Mirai, I get how you feel. I really do. So at the end, I’ll say I’m glad this episode of Boruto NNG was decently good. I almost dropped this show, but given this episode and the key visual floating around that indicates the series finally covering the events of the movie, I think I’ll stick around a little longer. Also, next week seems to be giving us Mitsuki’s origin story, so that too, seems interesting to me. As for the rest of the episodes from a few weeks back, I’ll finish up those posts and release them soon. Hopefully my groaning and complaining can end with this post, and the show can properly win me back. As for those of you who are still watching this series, I’m curious what you think of the series and this episode? Is it still good enough for you? What do you enjoy about the series that makes you stick around?